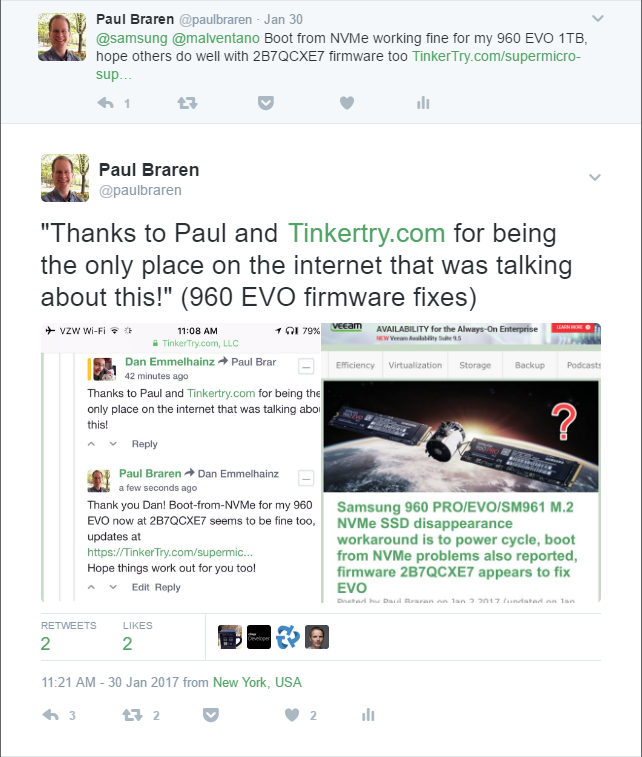 This article has had several significant additions since initially published, to incorporate new findings from amazingly helpful readers who commented below, including a new 960 EVO firmware 2B7QCXE7 that seems to have solved the issue for me on Jan 29 2017, and firmware 2B6QCXP7 fixed the PRO several months later, once I was finally able to download it. I'm apparently starting out 2017 smoothing out bumps-in-the-road that a few home lab enthusiasts ran into recently during their normally fun holiday season of home lab rebuilds. 'Twas the season for many IT workers to be off from work, myself included. This is my second such article this year, but at least we've put these issues to rest quickly, together. It's times like these that I'm so glad I have a web site with comments, so we can all spend more time working and playing than fixing. Click on image to launch full view of the complete table. Despite all that, and the year that has gone by since, Supermicro apparently still has an inexplicable reluctance to testing Samsung M.2 NVMe drives, which might well be the most popular M.2 NVMe drives on Amazon for over a year now. It would seem they could sure use a friend at Samsung, and a budget to give them time to expand well beyond their current list of only SATA3 M.2 devices, and half-height PCIe devices. I would propose they divert most of those testing funds toward the forward-looking M.2 NVMe form-factor instead, since apparently it's needed now that we've seen this strange issue crop up. It still makes me nervous that no M.2 NVMe devices have made their list yet. wdmia reporting his 960 EVO experiencing the same issue, with the same fix working. Now this really had my attention. TheGrayGhost reporting his Supermicro case #SM1701012591, a 960 EVO with a Flex ATX Xeon D motherboard with the latest BIOS 1.0b, same issue, same fix. Dang, this is all Xeon D, Mini-ITX and Flex ATX models, aka, all SuperServers with X10SDV in the motherboard model number. Supermicro SuperServer owner goes into their BIOS and saves their changes. The OS then boots, but doesn't "see" the 960 PRO or EVO drives, at all. After saving any BIOS changes, don't just power down, but also remove the power cord for a few seconds. When plugging back in and powering up, the drives are visible to whatever OS you're running again, with no data lost. This is more like a workaround, while we wait for a proper fix that will likely come in the form of a BIOS update at some future date. This is one of the stranger issues I've seen, and I don't have any technical explanation for it, that's be pure conjecture. This is a relatively minor inconvenience, but I'd say it could be pretty darn serious if you don't have a way to remove all power from a remote system! Of course, I've reported this list of reports, and the below video, to Supermicro. There is currently no known fix, it's likely a proper fix would involve installing a future BIOS update, whatever comes after BIOS 1.1c for Mini ITX models, or after BIOS 1.0b for Flex ATX models. I was able to easily replicate the issue today using my Supermicro SuperServer SYS-5028D-TN4T system today, as seen in the below video. I'm currently using BIOS 1.1c and IPMI 3.46. No data loss, only time and a bit of product confidence lost. 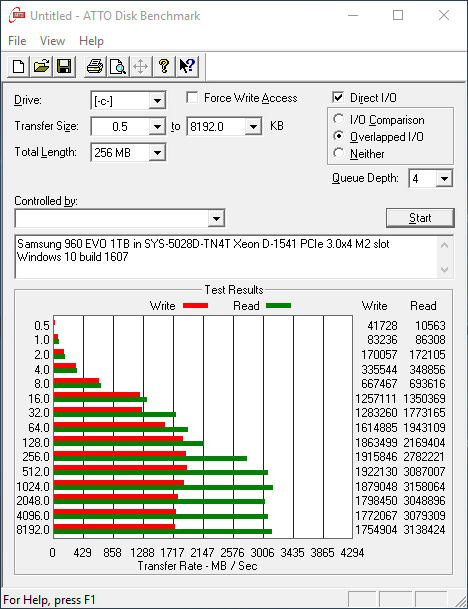 I have additional serious information on this M2 Samsung 960 PRO NVMe issue (1TB). Important: This is WITHOUT ever entering the BIOS setup screen whatsoever. 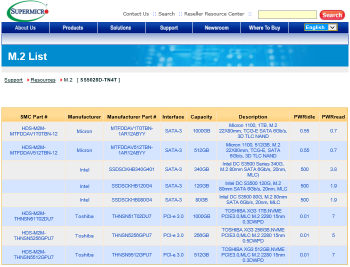 Reproduced on: X10SDV-TLN4F (SYS-5028D-TN4T-12C). BIOS: 1.1c. IPMI: 3.46. Configure internal SATA drive to boot any OS, in my case Win10x64; graceful shutdown. Insert a bootable USB stick, in my situation one that has ESXi 6 installed. 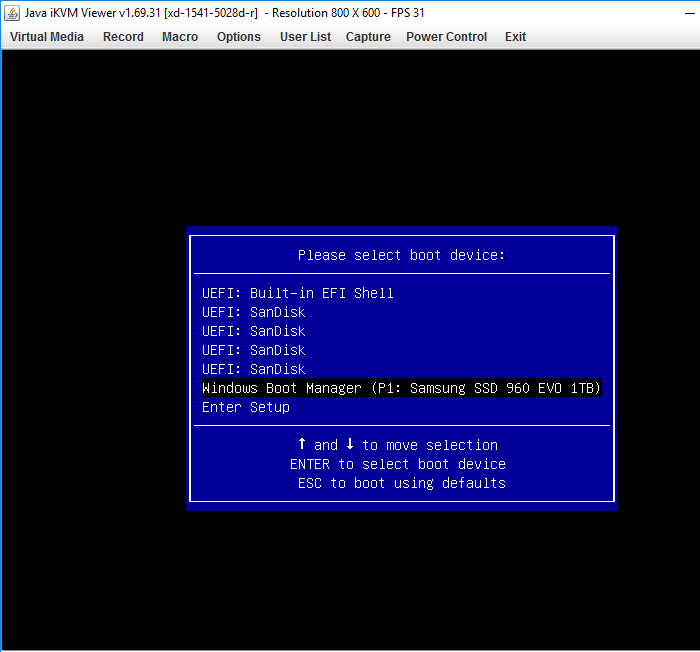 BIOS auto-inserts the new boot device in its list, and changes its boot order to accommodate. System hangs, reboots, then exhibits the problem discussed in this article (NVMe vanishes until unplug-replug physical power). Configure IPMI to boot from external ISO, in my case IPMI 3.46 uses HTML5 Net Path. BIOS auto-changes the boot device name and settings in its boot device list. System then exhibits the problem discussed in this article (NVMe vanishes until unplug-replug physical power). This is obviously a serious bug here. While it's unlikely full vSAN support (see VMware vSAN HCL) will arrive for consumer drives like the 960 series because of the generally lower TBW ratings than enterprise drives and lack of supercapacitors, the sort of nasty behavior that Gert reports makes even simple experimentation with an unsupported vSAN quite challenging. 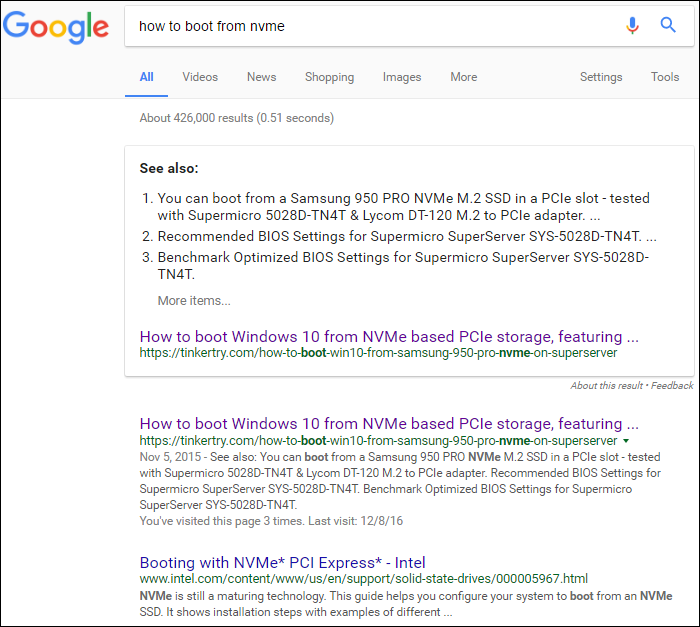 Thank you for that, hopefully this helps too..
(You may want to pass along to your SuperMicro contact, that it appears SuperMicro is now specifically ADVERTISING Samsung m.2 NVMe compatibility.... so hopefully that lights a fire and motivates them to push this issue up their support-chain for the greater good). 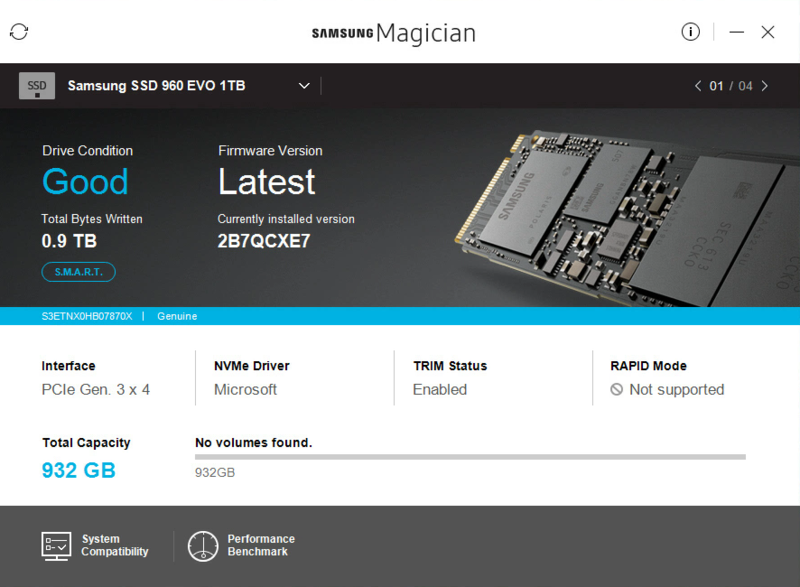 Edit: The direct-link to Samsung m.2 NVMe drives has an "&" in their URL so it won't save here properly, but if you click the link, then the "Samsung" link for "Show Qualified M.2-SSD SKUs" on that page, you'll see the list..
AND: On that same page, note Supermicro has listed in the "..Systems which support M.2-NVMe-SSD: (Mini-Tower Systems.. SYS-5028D-TN4T).." I think that says pretty clearly this is intended to work. and added an appropriate warning sentence to the related articles. The point here is that Supermicro does actually have some 2015 vintage Samsung M.2 NVMe drives on their supported SSD lists. This sets a precedent that some Samsung M.2 NVMe drives have been tested by Supermicro in the past. The hope here is that Supermicro would test and support newer Samsung M.2 NVMe drives such as the Samsung 960 series of products (960 PRO/960 EVO/SM961/PM961). I've been trawling forums all day and the problem is reported pretty much being reported everywhere with the new Samsung 960s, might not be anything to do with Supermicro at all. My money is on either a bad firmware bug on the 960 end or problems related to NVMe 1.2 protocol implementation on most chipsets (could explain why the 950 with NVMe 1.1 works so well). A lot of forum replies to posters with the problem are just putting it down to the usual newbie problems with NVMe booting/UEFI and stuff but it seems pretty obvious there is a common cause only affecting the 960s. 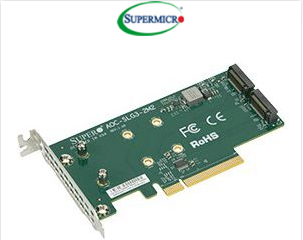 and note that Aaron opened up Supermicro case# SM1701142769 as well. The PM961 isn't in the title of this article, since I've not yet found reports of problems with that drive. I would expect it will show the same issue though, since it's closely related OEM twin called the 960 EVO is afflicted with drive invisibility problems. I found the fake keyboard noises and long "thinking" intervals kind of funny, then waited patiently after a ring was heard, with eventual success. I have not been able to reproduce the loss of drive visibility in the slightly different drive configuration my system was in. This has meant it's taking me more time to get this test/upgrade fw/retest done than I had thought it would. I will have an update to this article later today. 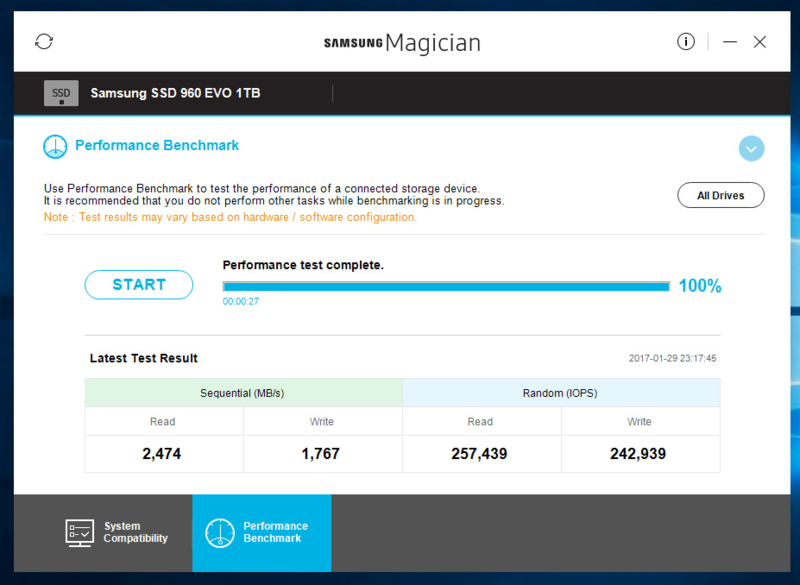 Updated Samsung 960s firmware with magician software today, now 960 nvme persisted through non-power cycling reboot. Still some issues with use as boot device though. As for folks with home vSAN aspirations, I never claimed using consumer drives for such things would be a good idea, see Dispelling myths about VSAN and flash. for details about Power Loss Protection. The original article above erroneously stated the new firmware was 2B7QCE7, that was a typo, it's actually 2B7QCXE7, with all instances above now fixed. As seen on video below! rebooted, drive still visible, success! rebooted, made BIOS change, drive still visible, success! 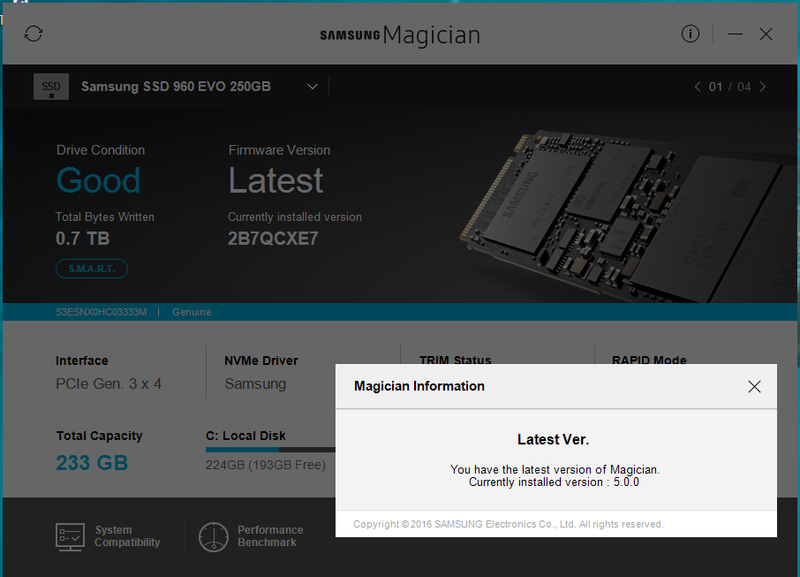 I still have not heard if a firmware update is available for the Samsung 960 PRO owners, and the outlook for SM961 owners afflicted is may be glum, since historically Magician won't update the firmware on OEM drives. I'm on a plane early tomorrow and away all week, so I won't be deciding on processing those 2 RMAs for my 960 EVOs anytime all that soon. I'll test a few more reboots tonight to continue to build confidence that this issue is resolved, updating the article if something new crops up. Ideally, I'll sneak in some boot from NVMe tests as well, after first evacuating all the data off that VMFS datastore that's on there now. Luckily, that's easy with vSphere's Storage vMotion. I'll also leave my other 960 at the original 1B7QCXE7 firmware for now, in case I need to test with Angelbird Wings or (new/just received) Amfeltec 2 way and 1 way riser cards later on. Even if those do work-around the issue though, I'd much prefer a firmware fix, of course. Before the upgrade, my Samsung 960 EVO 1TB was at 1B7QCXE7. After the upgrade, my Samsung 960 EVO 1TB is at 2B7QCXE7. I used Veeam Agent for Microsoft Windows (beta) to restore my fresh Windows 10 installation onto the 960 EVO 1TB, and yes, boot from NVMe is working fine on this SuperServer, this is good! Since the firmware upgrade, no further incidents of drive disappearance have been seen. Enhanced compatibility and stability for systems supporting PCIe. I have not yet had a chance to test this ISO, but glad I kept my 2nd 1TB 960 EVO at the older firmware so I can give this method a try! Still no info on 960 PRO firmware. since months have testing seem to confirm that the firmware fixes really worked. Samsung tells M.2 NVMe SSD firmware updaters "Download Limit Exceeded. We apologize for your inconvenience." Seriously?